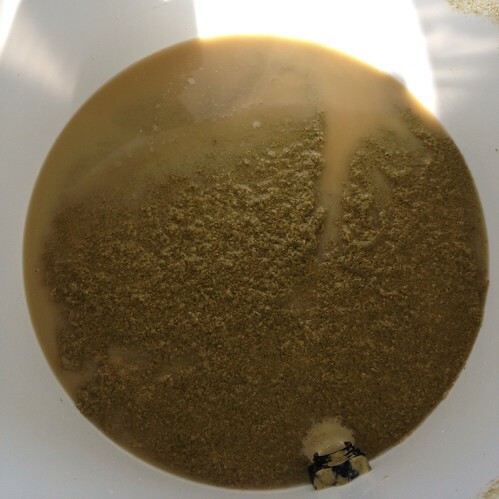 AG#124 – Big IPA – Using BrewMate instead of BeerEngine as it lets me set attenuation so hopefully the beer should turn out about 9.2%, its loosely based around a recipe in the Mitch Steele IPA book. Sorry I haven’t had time for blogging lately I have had my head full of Wishbone Brewery stuff with thoughts about a prospective unit and then just this week a different unit and different restrictions and different potential, its all fun but I’m itching to get something set in stone and order the brewhouse equipment. Single step Infusion at 66°C for 60 Minutes. 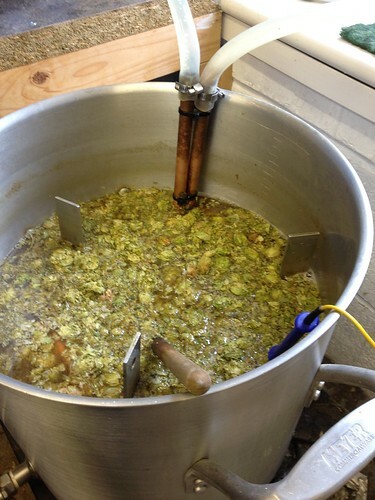 I’ve basically made Hop-Stew 😉 And hit the OG I got 1082 and liquored back to 1080. 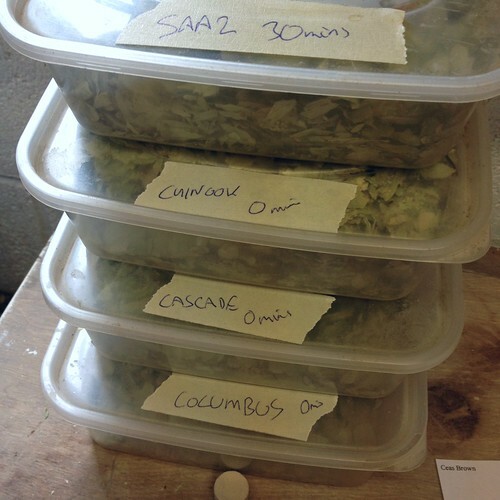 A few of the hops in the recipe changed as I went along due to what I found in the hop-freezer, I’ll dry hop in two parts half will go in when FG is reached then half 2 days later when I start chilling the beer so a half warm and half cold dry hop. 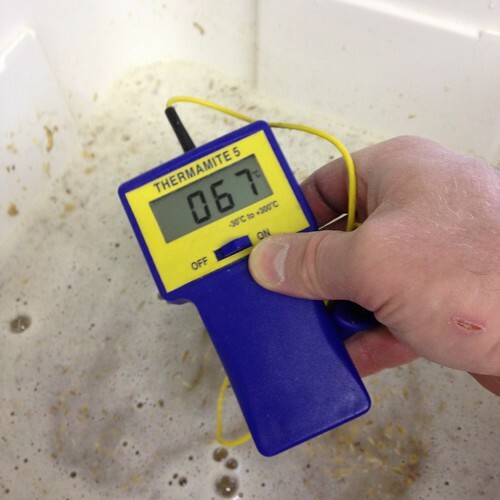 *22nd Jul ’14 – FG seems to be 1010 and steady, chilled to 17°c and dry hopped with the same T90 hops again. 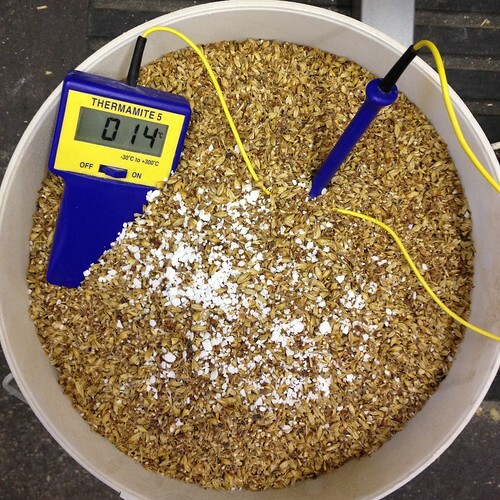 *24th Jul ’14 – Chilled to 13°c, will chill to 8c before bottling. 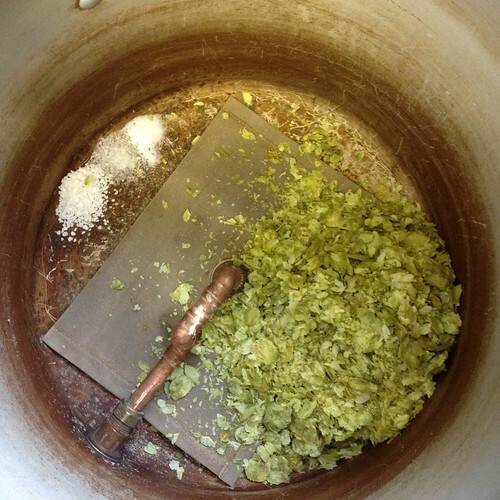 Challenger Bitter – An English hopped Bitter hopefully with a massively malty presence. 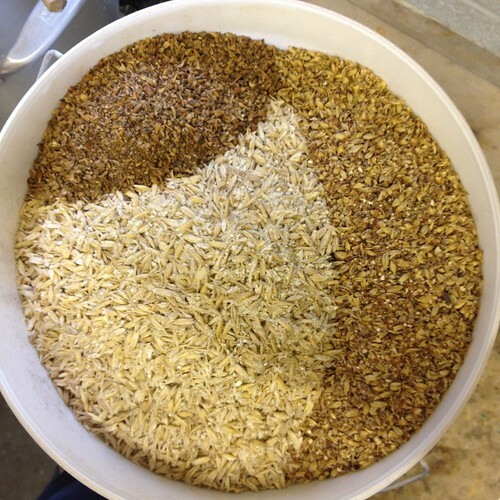 I’ve been wanting to do a 50% of each Munich+Vienna malts for a while, ideally as an IPA but I thought this would work quite nicely as I’m planning to serve it through a BeerEngine from either Cask or Bag-in-Box. 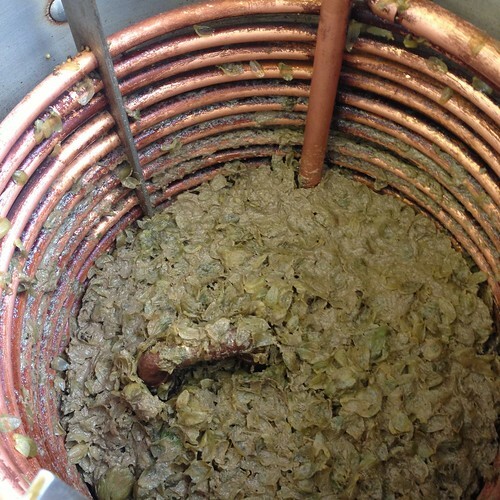 Not the best start to the day, I found I hadn’t cleaned out the hops from the copper from the last brew so dug them out and gave the IC and ball-valve some extra TLC Boiling it while the mash was on. *Racked to Bag-in-Box 11th Jan ’14 with 15g priming sugar and Allkleer Isinglass Finings. 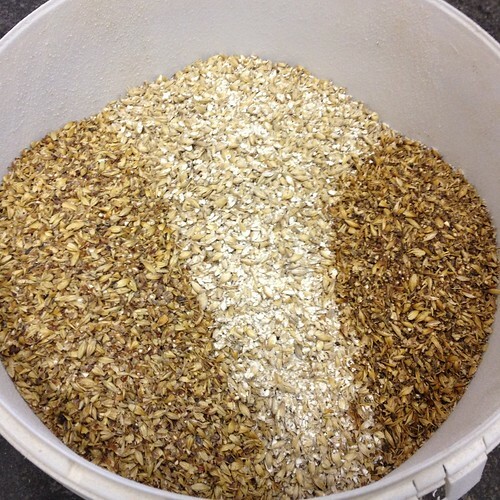 Gods of War – An impromptu brewday and a half-baked earlier idea to use Warrior & Zeus hops for the first time, I’m going all out with the Cara/Crystal with some Melanoidin Malt to make up for me not having any Munich which was substituted by Dark Wheat Malt. 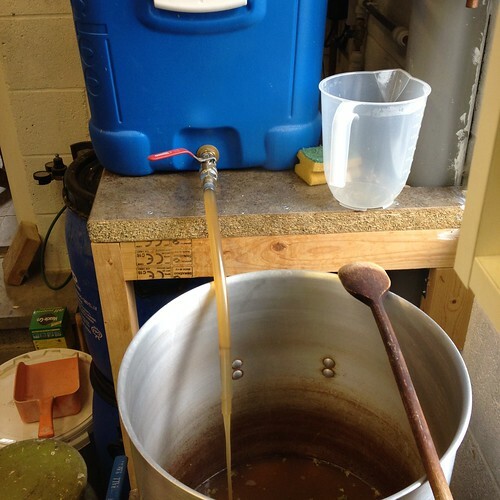 Yeast was rehydrated in cooled boiled water as instructed, it will be fermenting at the ambient temp of the garage to start with as last weeks brew is still in the brew-fridge. 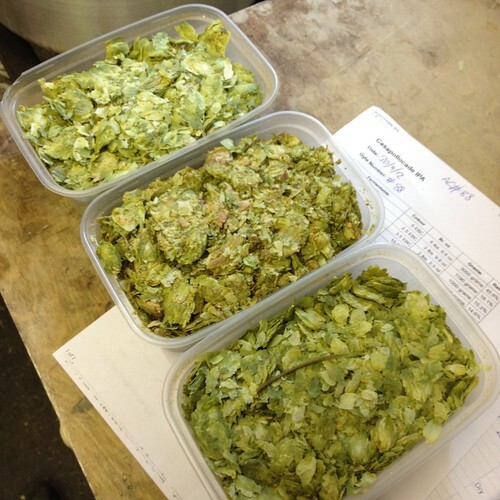 *24th Aug ’13 – Dry Hopped today with 30g of each hop, Apollo, Warrior & Zeus (almost 4.3g per litre) Hopefully bottle mid week. *Bottled 29th Aug ’13 – with 80g white sugar, tastes sort of like a weird liquorice, unsure of this hop combo so far, maybe it will improve with some time in bottle. 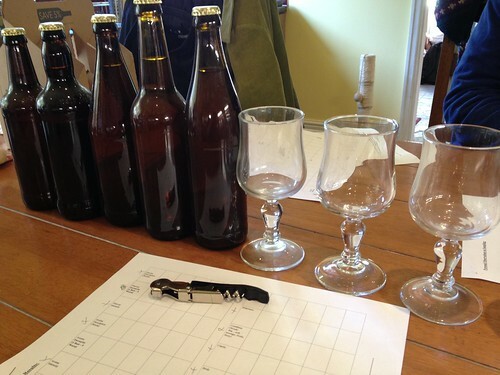 *8th Sep ’13 – Taster bottle, this is coming along quite nicely, the colour is good and it has just enough dry hop presence, it could use a little more body but otherwise a pretty easy drinker. 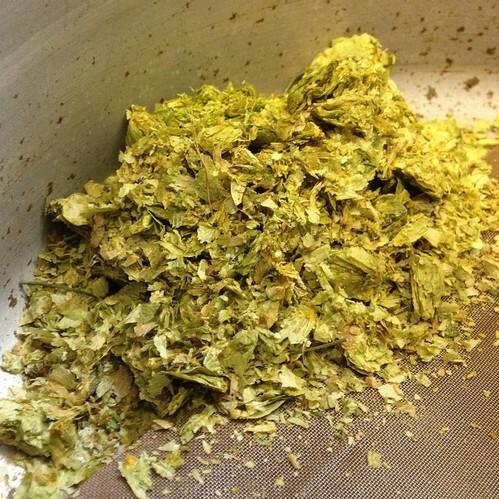 The hop flavours I was unsure about have gone and its light “Pithy” character (*Pithy used courtesy of @hopzine). 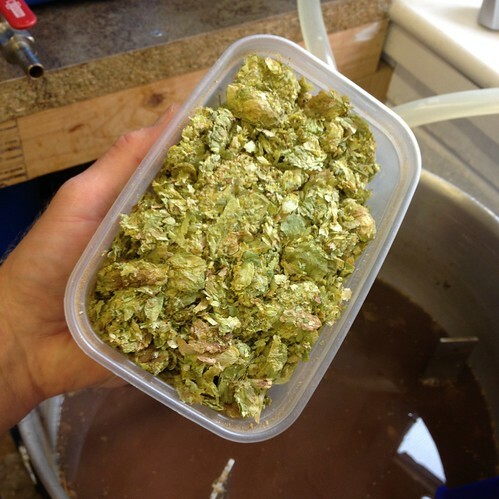 Altitudinous Cable – I’m hoping for a ‘MagicRockBrewing Highwire / PartizanBrewing Columbus Chinook Cascade IPA‘ type of thing, bags of flavour and seriously dry hopped. 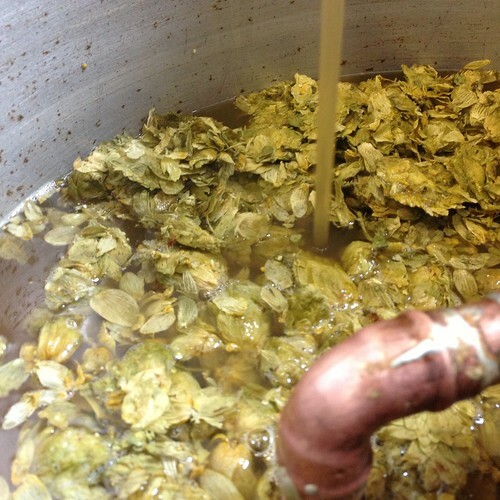 My 100th All-Grain Brewday was supposed to be an all-Fuggle Double IPA with a great big Fuggle Dry Hop, have beery mates round and cook food / drink beer / forget the Protafloc etc We’ll have to plan that for another time as I wanted something that will be distinctly hoppy with in-yer-face dry hopping, so what better beer to try imitate than MagicRock’s Highwire, a beauty of a beer at only 5.5%. Easy brewday, did a bit of a Garage tidy while I was at it. 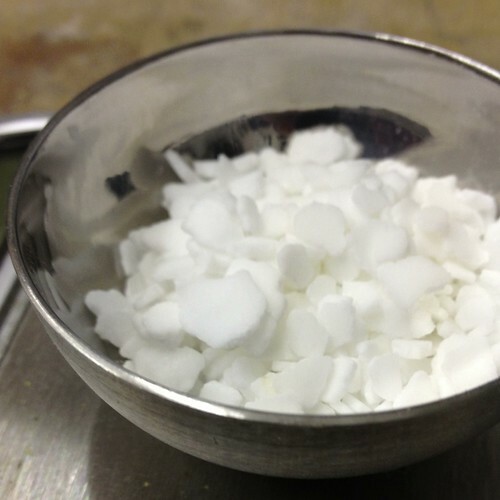 I only gave the mash 1 Tsp of Calcium Chloride as I’ve had some comment on the dryness of my homebrew, so no other liquor salts for this brew just as an experiment. 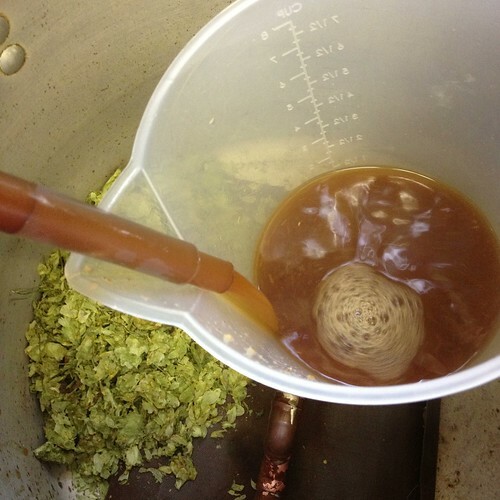 *22nd May ’13 – Gravity at 1014, first dry hopping addition of 3g/litre Cascade, Columbus, Chinook (75g in total) it will be left at 20°c for 2-3 days, I’ll give the FV a stir tomorrow. 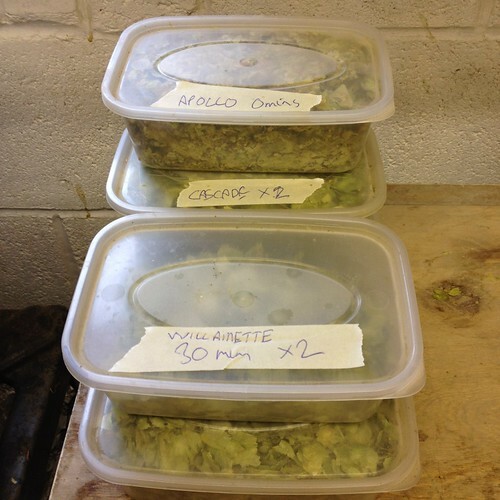 *27th May ’13 – The 3rd Dry Hop: 24g Columbus, 22g Chinook, 21g Amarillo (2.65g/litre in total), so all in all its been dry hopped with 10.65g per Litre of beer. Tastes a bit raw. 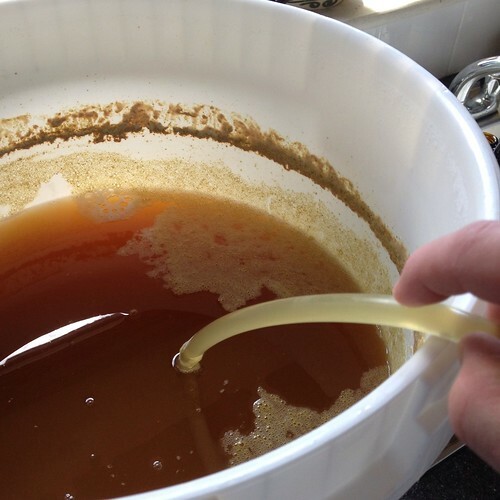 *1st Jun ’13 – Bottled with 120g White Sugar, I lost 3 Litres to the hop pellets/yeast, tasting pretty good has some rough edges but nothing that a week or two in bottle won’t cure. 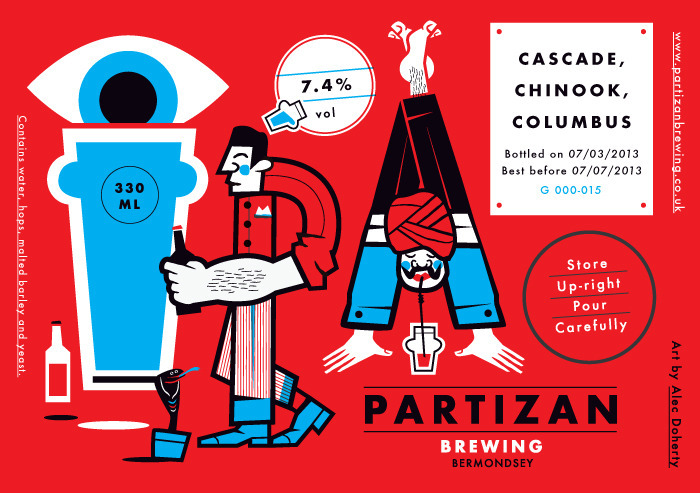 At this stage I would think that an almost 100% Chinook dry hop would be closer to a MagicRock/Partizan beer. 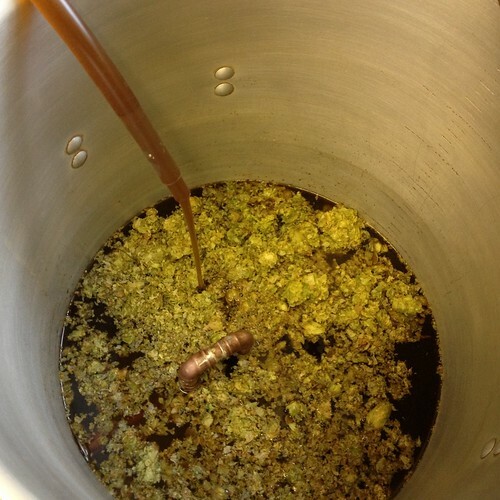 *8th Jun ’13 – early taster, its carbonated up just right, the bitterness pretty good, the dry hopping is going to take a week or two more to round off and loose the rough edges, cloudy as heck thanks to all those hops! 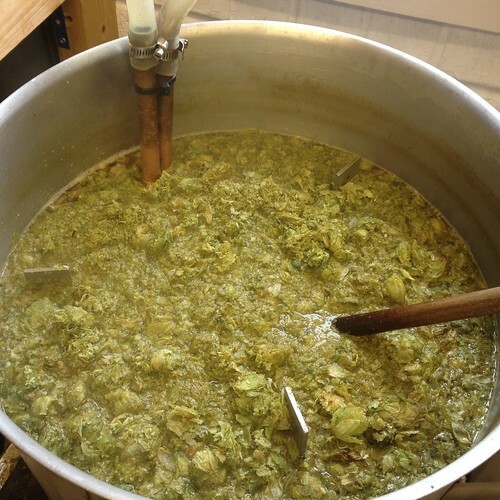 *13th Aug ’13 – Some time later, this is smoothing out but keeping its intense hoppyness and a nice sort of flat-tingle-spice-bitterness, it finishes with the body coming back in as the hops linger in the mouth. 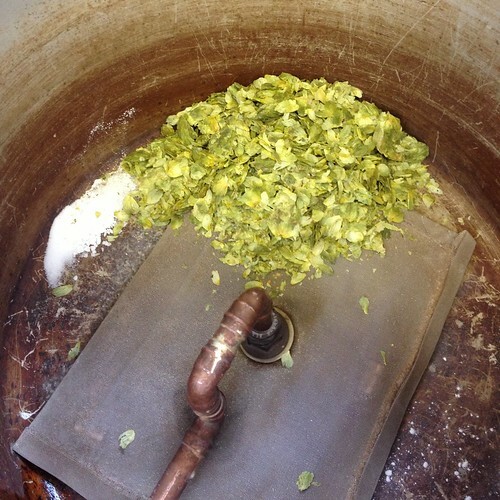 Next time I’ll not leave the hops in as long and maybe concentrate on dry hopping with just Cascade & Chinook. 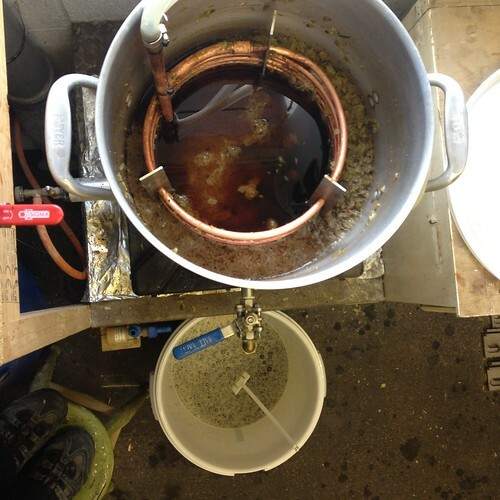 Brown Ceas – This is my NCB / Saltaire Brewery brew for the bar, an American Style Brown Ale, loosely based on my previous ‘Steaming, Brown & Sticky‘ of last year, this is going to be a little lighter in colour as the other version was almost black, or at least a very dark brown. 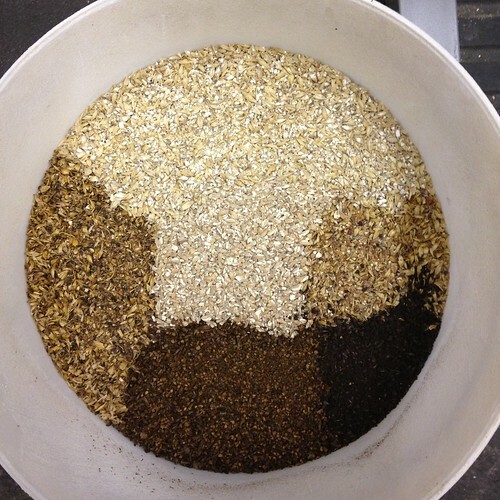 ‘Brown Ceas’ its like the 3-Cs Cascade, Columbus, Chinook and its brown! 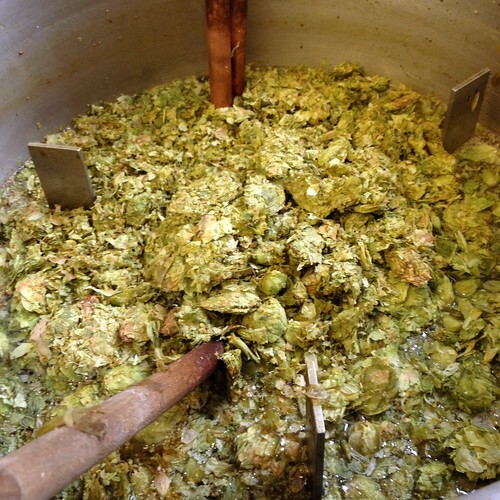 Bittering will hopefully be nice & spicy from the Aramis & Saaz, and I’ll have a Hop-freezer rummage for American Pellets and give it some dry in the fermenter. Bit of a late start but all done and dusted, liquored back just short of 3L from 1052 to 1045 getting a 21.92 Litre yield so only 1L short of target volume. 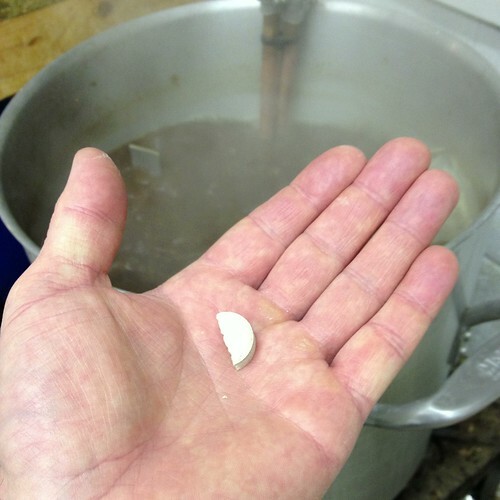 I almost forgot to add the Protafloc ‘cos I was messing about on Twitter too much, extended boil by 5 mins to account for lack of concentration! 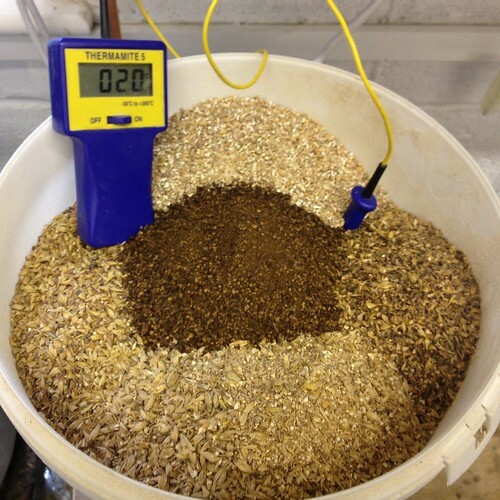 *24th Mar ’13 – Dry Hopped with 20g each of Cascade & Amarillo, so approx 2g/litre, Gravity at 1011. I also skimmed the yeast to use in my Robust Wheat Porter. Bravo+Apollo=Citra? 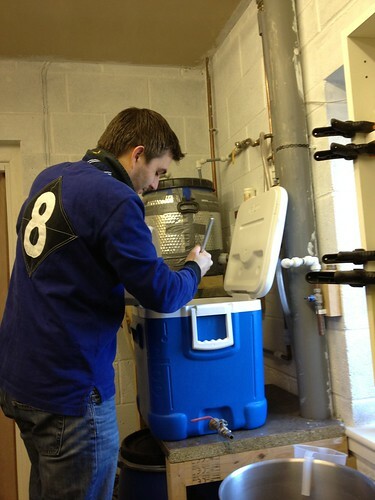 – An experimental brewday with added Brew-Monkey! Its something I heard Stan Hieronymus say on a Brewery Network podcast (1H.27mins in) about the Bravo+Apollo=Citra so thought I’d give it a go, so ordered some Bravo to go with the Apollo I already had. If its any good I’ll maybe enter it into the Northern Craft Brewers & Saltaire Brewery Competition. Thats experiment No.1, experiment No.2 was for SimpleOne on JBK (@Beehaveeor on Twitter) who wanted 5 beers marking for a hopping experiment he’s conducting, this second experiment also involved Dave @broadfordbrewer who came over to eat our food and drink our beer… and most welcome he was too. 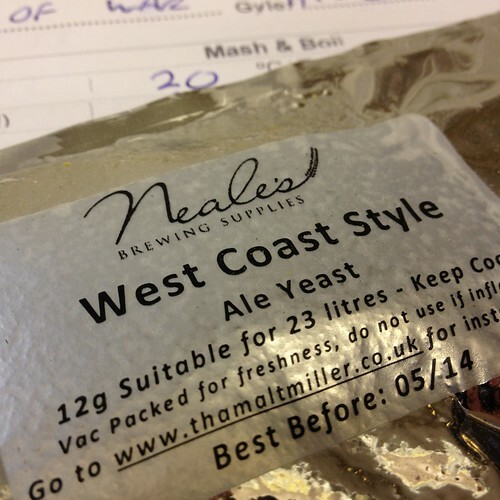 Mash: 60mins minimum, as we had beers to drink! 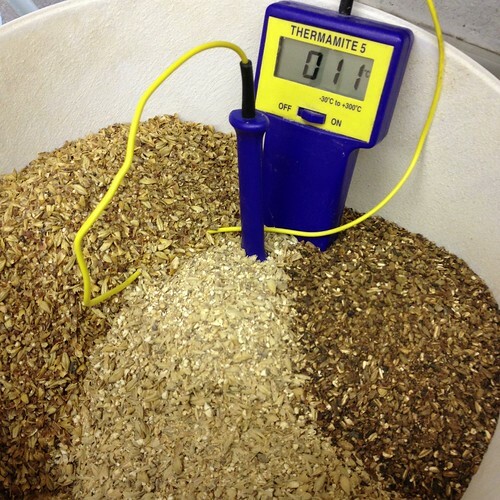 Did a 2.5 Litre Liquorback to get OG 1055, so less than 1 Litre short on predicted brew length. *8th Mar ’13 – Gravity at 1020 and tastes rather nice, its definitely not Citra but its certainly good beer 😉 Might Dry Hop with a few grams of Bravo & Apollo. 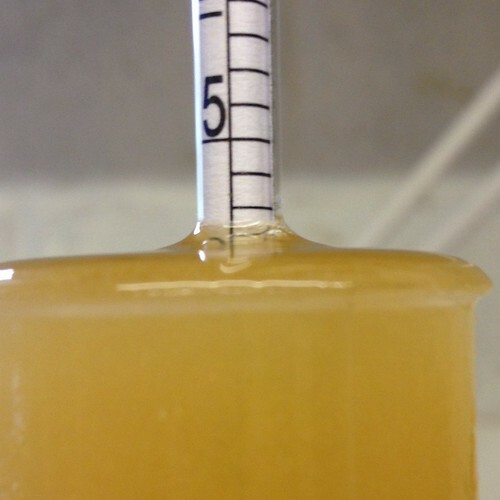 *Bottled 16th Mar ’13 – with 110g of white sugar to about 20 Litres, tasting good, pretty Peach / Mellon type Uber-Cascade-Amarillo thing going on. 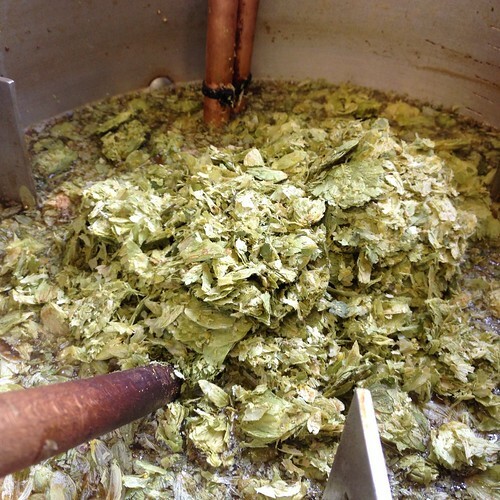 This beer is not shy and promises to be brash on the bitterness with floral, “dank” and piney notes, the Apollo are pretty pungent and might be better suited rolled in some Rizlas than soaked in wort! 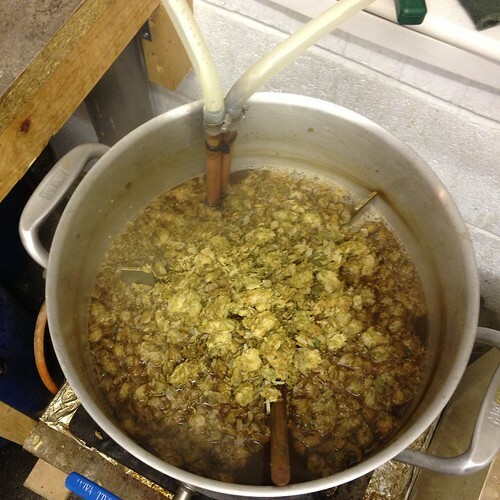 All done, busy day; brewing, Exam revision, and tiling the kitchen…! 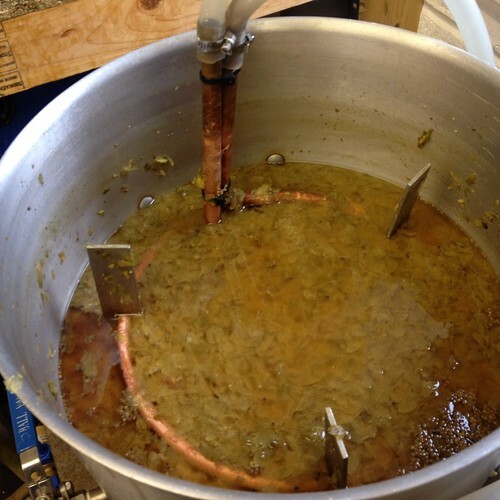 *7th Oct ’12 – Down to 1012 @ 22°c think its done, should I or shouldn’t I dry hop, wasn’t going to… Tastes to have a similar pungency to Green Bullet / Bobek in the mix. 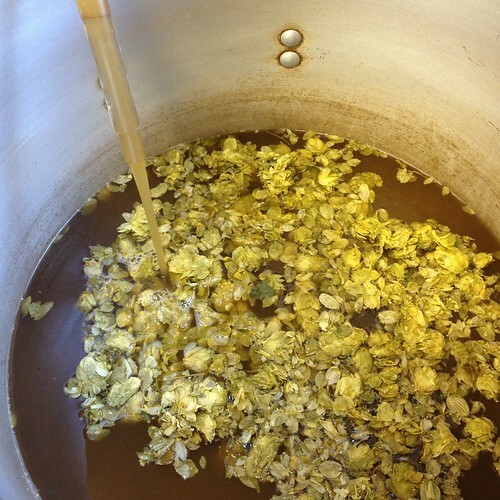 If I do dry hop I may use Magnum to test out an idea. 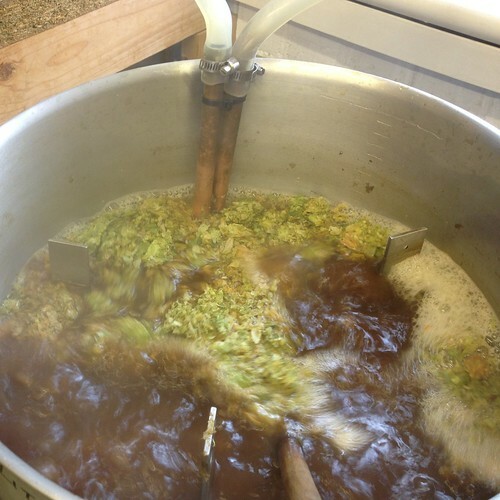 *22nd Oct ’12 – Taster bottle, this isn’t bad, bags of flavour it will hopefully dry out a little in bottle and become more of the IPA its meant to be, I never bothered dry hopping btw. 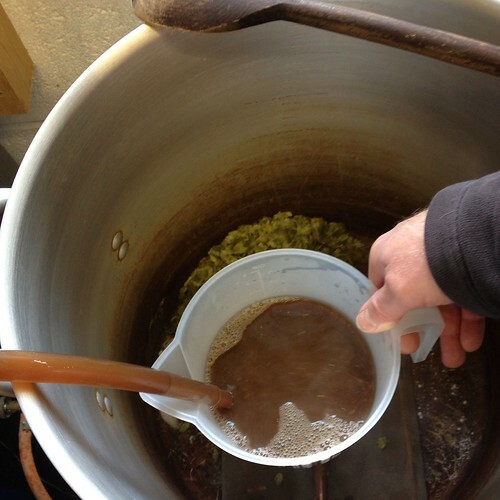 *1st Nov ’12 – I’m actually really enjoying this beer, bags of flavour, plenty of body and a tingle of bitterness without being too harsh.